This is a sponsored post on behalf of Unilever. All opinions expressed in this post are 100% mine. Let me start by saying that I don’t spend all my Sundays watching football. Maybe you can tell by following my blog? However, there are a few exceptions: Since my husband went to grad school at Stanford, we like to catch games at the Stanford stadium, and then there’s the Super Bowl, especially if the New England Patriots are playing…and this year they are! My husband is from Massachusetts, and seeing that we’ve been together since we were 20, I’ve been more or less raised to be a Pats fan. So this year, we’re going all out with Super Bowl madness (and we’ll be better prepared than that year we forgot to activate our cable before the game came on…oops). 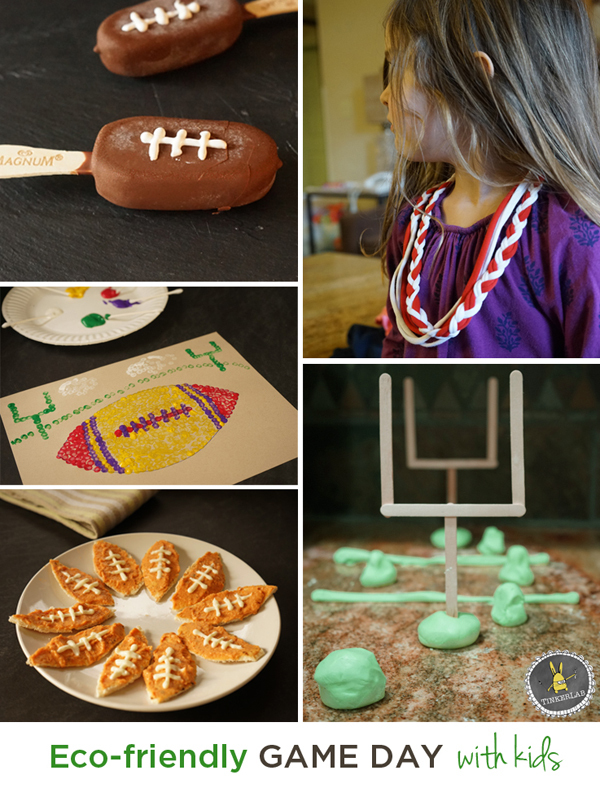 If you have a big game day ahead, I have five kid-friendly Super Bowl party ideas that just might strike your fancy. 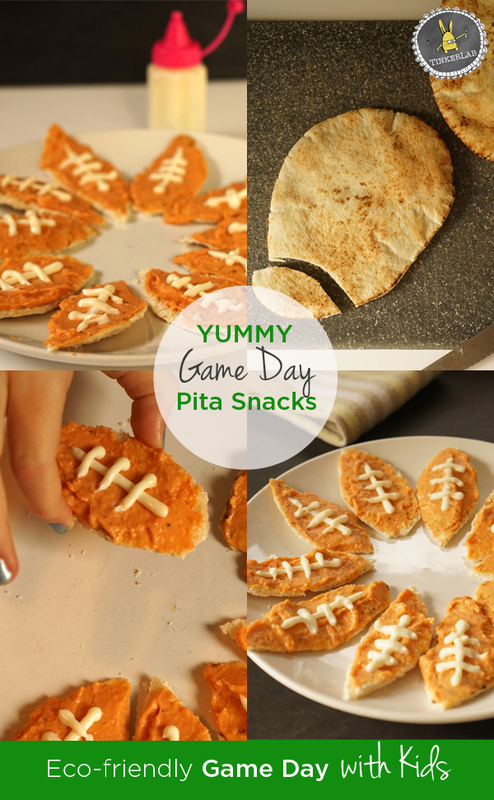 Here’s a tasty (and somewhat more healthy) Super Bowl party snack idea. These pita footballs are kid-tested, and my four-year old begged me to make a second batch once the plate was clean. Sauce bottle with a squeeze tip. I found the tiny sauce bottle at the Container Store. Fill a small squirt bottle with mayonnaise and draw lace stitches on your hummus. Fun Hummus Fact: Did you know that chickpeas, the primary ingredient in hummus, are rich in protein and they don’t contain any cholesterol or saturated fats! Go on and eat a big batch of this…it’s good for you! You have to show up at your Super Bowl party wearing team colors, am I right? My kids loved this project, especially the part where they stretched and pulled the t-shirt fabric. It’s really fun to make these, they cost very little (if you already have the shirt, it’s virtually free), they’re eco-conscious since you’re upcycling, and it’s fun to add a little color to your Super Bowl wardrobe, right? 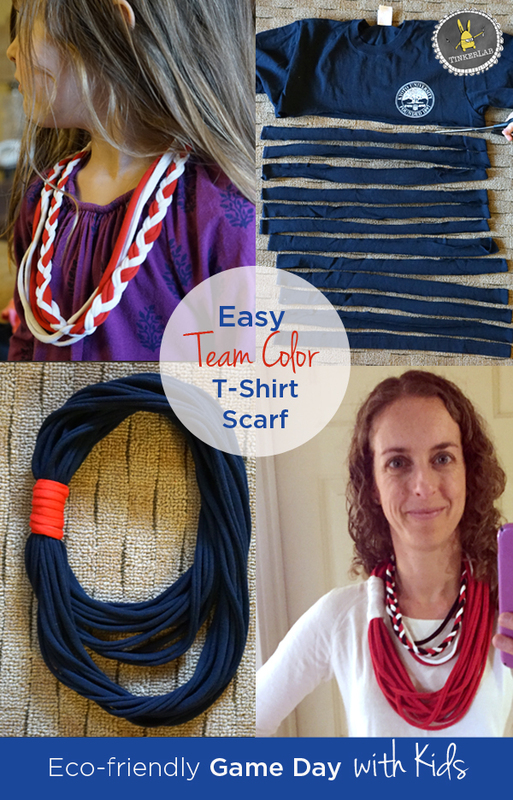 Find the full tutorial for the no-sew t-shirt scarf. A couple hours before play, glue four popsicle sticks together into the shape of a field goal. Now, make some play dough! This easy playdough recipe may be an unexpected Super Bowl Party Idea, but it could be a fun way to get young kids involved in the game. Full directions on how to make it here. Interesting football fact: 120 balls are used during the Super Bowl game, including kicker balls. There are 12 kicker balls, which are kept under lock and key until game time. Want more? Find out why NFL kickers squeeze the ball so hard before kick off. This fun project comes together fairly quickly. You can do this ahead of game day and display the results at your Super Bowl party, or set this up for the kids to work on during the game. This technique is based on an art technique called Pointillism. If you enjoy this, you can find lots of pointillism inspiration here. Paper. I used a 100% post-consumer eco-friendly paper called Desert Storm (affiliate). I found a good deal on it at a place called the Paper Mill Store. Washable tempera paint. I used both Colorations and Crayola (affiliate). Both are great! Draw a football shape on a piece of paper. Make it large enough to fill with a variety of dots. Squeeze a few colors of paint onto your palette. Place a Q-tip in each of the colors. 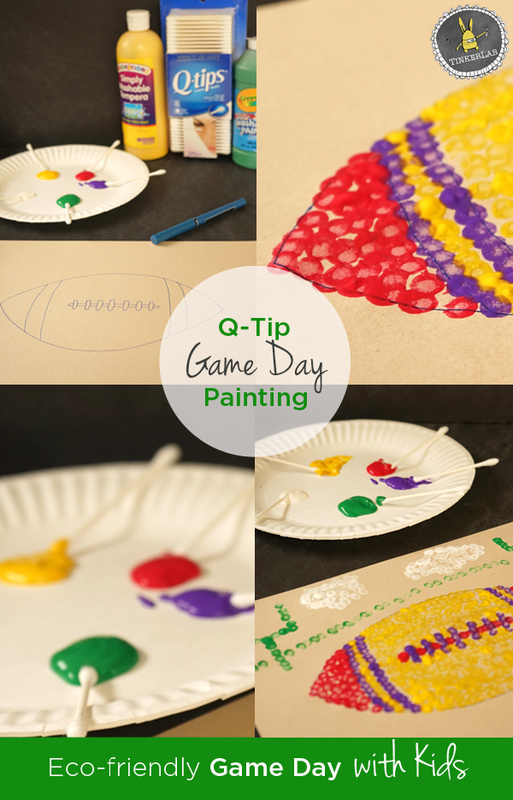 Invite your child to fill the football with dots and add their own designs. All colors and combinations should be encouraged! Fun Q-tip fact: Q-Tips sources paper and packaging from sustainable forests. How cool is that? Okay, I might just be saving the best for last. These taste amazing and they are so easy to make! I couldn’t believe my great fortune when I discovered that Magnum now makes mini-size ice cream pops. Maybe they’ve been around forever? I don’t know, but I’m happy to know exactly where to find them now (Safeway market, in case you have one near you). My family loves Magnum bars, and even better that the carry them in a mini size — my kids still enjoy ice cream, but without a huge overload of sugar. You’ll want to work quickly since the ice cream melts. Fill the sauce bottle with marshmallow cream. Working quickly, squeeze a stitch pattern in the middle of the bar. Traditional NFL footballs have eight stitches across, but three is all I could fit! If you don’t eat these right away, of course you’ll want to store them in the freezer until you need them. Fun Ice Cream Fact: The first ice cream flavor that was invented after the standard vanilla, strawberry, and chocolate was rocky road (and yum…that’s my favorite flavor!). Enjoy the game (and go Pats!). More about Unilever’s green efforts: Unilever is behind many much-loved brands that touch two billion people every day around the world, and a global leader in promoting sustainable living. Sustainable living is already evident in many of the social missions of Unilever. 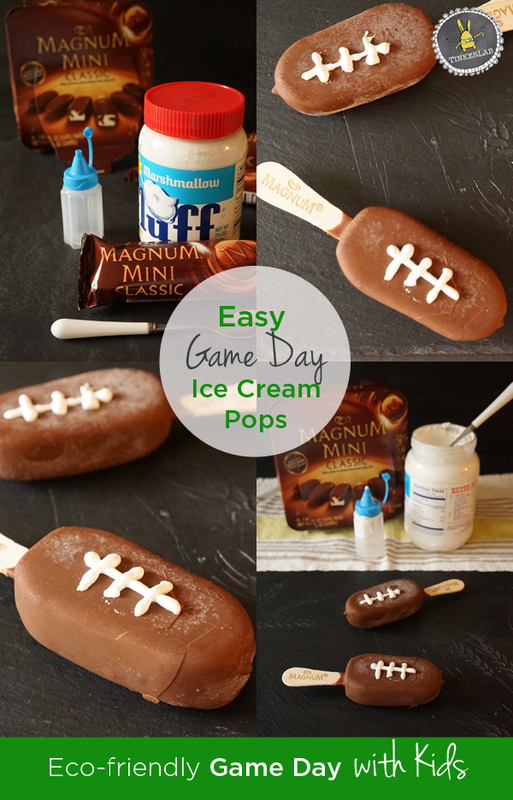 For eco-friendly Super Bowl ideas, check out my Pinterest board, Green the Game and Unilever’s board HERE. AND For even more recipes from Unilever go HERE.